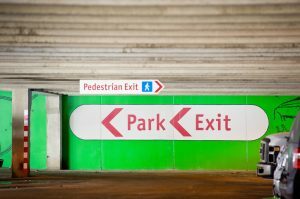 Whether a university, municipality, airport, transit agency, or private parking operator, wayfinding is something we should all spend some time on. A successful wayfinding signage implementation will result in a dramatic benefit to you and your customers. Questions encountered in the field will change from “Can I park here?” to “The administration building is over there, right?” Good signage will lead to fewer parking citations written and more obvious justification when citation appeals are upheld. An effective wayfinding signage design process generally takes an interdisciplinary approach and brings together end users, wayfinding experts, your organization’s marketing team, key stakeholders, and power users. Your project scope should identify the target audience and what its members need to know. Not every wayfinding sign is a directory sign. Not every wayfinding sign is a regulatory sign. Think about how much someone can read while walking and what size font you need. Apply the same thought to vehicles driving at different speeds. Wayfinding signage is often the first visual representation of your brand a customer encounters. The signs should be eye-catching, easily serviceable, and easily editable as building occupants and uses change. Whether a campus, business district, or transit center, wayfinding signage is often the first thing visitors seek out when interacting with your built environment. Thomas W. Gaffery IV, MBA, CAPP is direct of parking and transportation at California State University, San Bernardino.